"He is not here. He is risen!" Luke 24:6. Read 1Corinthians 15 and appreciate again the anchoring truth of the Resurrection of Christ. Many in the world believe in the historic Christ - that there was a man who lived on earth called Jesus - but they believe the truth of the resurrection is a fable, far-fetched, and wishful thinking. Perhaps even more so than the Christmas holiday - the calendar weekend that recognizes the death, burial and resurrection of Christ is an opportune time to reach out to the community with the absolutely unique and distinguishing truth of the resurrection. Recently a mass email was sent out to many Christians requesting ideas and examples of how to use the Easter weekend for Gospel outreach. It's fair to say that I was not inundated with responses. It could mean the Easter Gospel Outreach Opportunity is an undervalued and underutilized annual event. It could mean many are busy with Bible conferences and are not available to organize something for their local community that weekend. It could mean that not many read the mass email sent out and those who did, may not have had time to respond. To those who did respond with website links etc. - thank-you. If you are reading this just now and you feel something else should be added be sure to email your information by clicking here and this article will be edited to include your submission. Here are a few things you may want to take a look at. International Bible House produces quality Gospel material. They not only have material already developed, they are open to your suggestions as to new material. They also have the ability to offer you a localized brochure that is relevant to your community. Click here to see an example of one production to announce Gospel meetings around Easter time. Their rates are extremely reasonable. Bible Truth Publishers #2 Text of booklet not available online. GTPress - He Is Risen (text not available online - sample has to be requested). This link doesn't have the full text which would have been more helpful. Moments With The Book Below I will paste the content of one of their Easter Tracts. 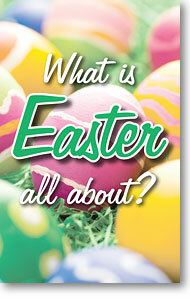 If you do not already have an Easter message on your website, you can contact MWTB and ask for permission to post their tract below on your site. Just like other holidays, the celebration of Easter has come to include many traditions, decorations, and fun events which have nothing to do with the real meaning of the day. Coloring and hunting for Easter eggs, eating candy, and enjoying a big family dinner are fun things to do, but the true meaning of Easter is not found in any of them. Easter is the time of year when Christians remember and celebrate the death and resurrection of Jesus Christ. You may notice that the date of Easter changes each year. This is because, historically, the timing of Easter has been linked with the Jewish Passover feast, which was taking place at the time Jesus died and rose again. In fact, the Bible links the sacrificial death of Jesus with that of the Passover lamb: "Christ our passover is sacrificed for us" (1 Corinthians 5:7). It might seem strange to some people that we remember and even celebrate the death of Jesus Christ. Why do we do it? Just like we would honor the loss of a soldier who died for our country, or a hero who lost his life while rescuing someone dear to us, Christians commemorate the death of Jesus Christ because He died for us-He died to rescue us. You see, each of us has a problem called sin. Sin is the Bible's word-God's word-for everything we do that goes against what God wants. We all sin by doing things we shouldn't do like lying, stealing, or swearing. We also sin in other ways, like having improper thoughts and attitudes-even by not doing things we know we should do (Matthew 5:28; James 4:17). What does this have to do with Jesus? Well, Jesus, the Son of God, is the only person who ever lived a perfect life without any sin. Because He is sinless, He was perfectly qualified to become our substitute: "Christ also hath once suffered for sins, the just for the unjust, that He might bring us to God" (1 Peter 3:18). That is the very reason God sent Jesus here: He came to open the way of salvation by bearing "our sins in His own body on the tree" (1 Peter 2:24). Yes, He did. The Bible is very clear on this, and even gives a list of witnesses who saw Him alive again. In addition to the apostles and others who are named, Jesus appeared to more than 500 people at one time (read John chapters 20 and 21; 1 Corinthians 15:1-8). The fact of Jesus' resurrection is not only a demonstration of God's power and majesty, it is a proof that God is satisfied with the work Jesus did on the cross when He suffered for our sins. Because of who He is and what He has done, Jesus-the living Savior-is the only way to Heaven. He said, "I am the way, the truth, and the life: no man cometh unto the Father, but by Me" (John 14:6). Do you want to be free from your sin-free from the burden and weight of sin which is dragging you down to Hell? Turn to Jesus. You need a Savior who can stand between you and God, one who can make peace with God for you (Romans 5:1). Jesus died for you and rose again; He is the savior you need! God's message to you is simple: repent and believe (Acts 20:21). Acknowledge that you are a lost sinner in need of the Savior. Reach out by faith and lay hold of what Jesus has done for you. He will take away your sins (1 John 3:5), give you peace with God, and make you a new person (2 Corinthians 5:17)! "If thou shalt confess with thy mouth the Lord Jesus, and shalt believe in thine heart that God hath raised Him from the dead, thou shalt be saved" (Romans 10:9). "Jesus said unto her, I am the resurrection, and the life: he that believeth in Me, though he were dead, yet shall he live" (John 11:25).